We've been seeing a lot of great changes in Barbie, ever since she became a perky Computer Engineer with a bright pink laptop. But Zombie Attack Barbie is easily the greatest thing to ever have the Barbie name attached to it (even if it's not official). Including Zombie Ken. They're coming to get you, Barbie! From the 1950s onwards girls were encouraged to hone their zombie slaughtering skills in preparation for the inevitable apocalypse. 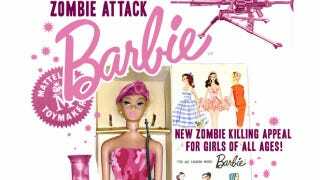 Though young ladies dispose of the undead with ease today, toys such as Mattel's 1962 ‘Zombie Attack Barbie' were instrumental in helping to habituate girls to a new social norm where zombie disposal would become a very necessary life skill. Now a collectors item ‘Zombie Attack Barbie' played a salient role in ensuring the survival of countless young girls who grew up ready and willing to slaughter the zombie menace. This much loved toy still holds fond memories for so many of the lovely ladies from our Zombie Clearance Squads today.